Di Drummond's concise and informative guide to Britain's railways will be absorbing reading for anyone who wants to learn about the history of the industry and for family history researchers who want to find out about the careers of their railway ancestors. In a clear and accessible way she guides readers through the social, technical and economic aspects of the story. She describes in vivid detail the rapid growth, maturity and long decline of the railways from the earliest days in the late-eighteenth century to privatization in the 1990s. In the process she covers the themes and issues that family historians, local historians and railway enthusiasts will need to understand in order to pursue their research. A sequence of short, fact-filled chapters gives an all-round view of the development of the railways. In addition to tracing the birth and growth of the original railway companies, she portrays the types of work that railwaymen did and pays particular attention to the railway world in which they spent their working lives. The tasks they undertook, the special skills they had to learn, the conditions they worked in, the organization and hierarchy of the railway companies, and the make-up of railway unions - all these elements in the history of the railways are covered. 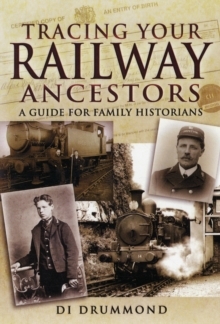 She also introduces the reader to the variety of records that are available for genealogical research - staff records and registers, publications, census returns, biographies and autobiographies, and the rest of the extensive literature devoted to the railway industry.